Anthony Peardew has been keeping lost things for a long time. On the day his fiance died, Anthony lost something precious that she had given him and he has never been able to forgive himself. As a kind of penance, Anthony retrieves lost things in the hope of one day reuniting them with their owners. In his last days, he leaves his house and all of the lost things inside it to his assistant Laura. Now it is her job to return all of the items and maybe rediscover how to open up to people again. The Keeper of Lost Things is Ruth Hogan's debut novel and it is an utterly charming one. The heart of this book is its characters. Laura plays the straight woman to quirky Anthony, an optimistic neighbor with Down syndrome, and a handsome gardener. There is a lot of humor and heart to be found within these pages. This book would almost be a buoyant read, if it weren't for the real emotional weight from the the characters' loss of both people and possessions. This story is a carefully orchestrated revealing of one story and then another, as we follow Laura in the present, Eunice and Bomber working at a 1970s publishing company, and vignettes that Anthony wrote about the owners of the lost objects. Hogan has an effortless touch to her writing and I would have happily read entire novels about any of these story lines. Sometimes a reader just needs a story where everything will turn out alright in the end and people are still motivated by doing the right, good thing. You will find that story here, with the perfect balance of tragedy and joy to keep you turning pages. 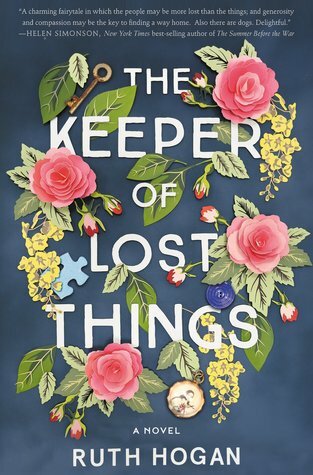 The Keeper of Lost Things reminds us that there are people who pay attention to others, people who are still willing to be kind, and people willing to help us put the pieces back together after a terrible loss. This reminds me of the kinds of novels that Anne Tyler writes. I agree with Lark, it does sound like it has an Anne Tyler vibe. I suspect I'd like this book a lot.